What the Iraqi mission will accomplish: Sending post cards to Congress demanding a stop to the funding of Islamist fighters is a worthy cause, but it does not stop the suffering of the tens of thousands of Christians made homeless. The post cards we sent to Congress demanding a stop to the funding of Sunni fighters do help. Someday Congress may stop the funding of Sunni fighters, but Christians in Iraq and Syria are suffering right now, from fear and pain and hunger. 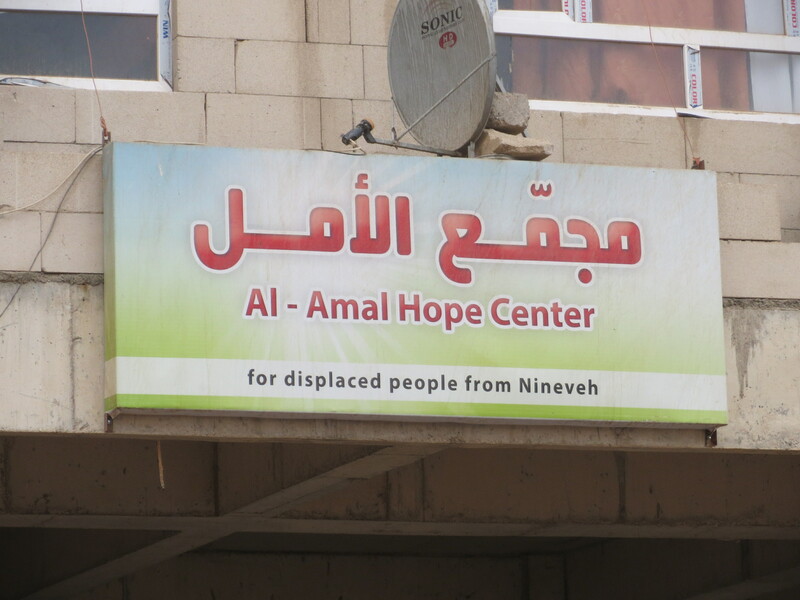 When the Islamic State drove the Iraqi Army out of Mosul and captured dozens of Christian towns, tens of thousands fled to Kurdish areas where they are not really welcome. What is never mentioned about the Kurds is that they are Sunni, only currently a bit more liberal in their theology than the ISIL. I say currently because the Kurds have in the past “cleansed” Christians from the areas they held. Their latest massacre of Christians was in Simele, Iraq in 1933. The current welcome to Christians in the Kurdish areas of Iraq may be because of a fear of aid and arms being cut off from the EU and the United States, and not a real change of heart. At the time of the capture of Mosul most of the ISIL’s weapons had been obtained with funds from the Saudi Arabian royal family, to help them overthrow the secular government of Syria which is for the most part Shiite and Christian. The Saudi royals, of course, want to replace the Syrian government with a Sunni state. But, the Saudi royals lost control of the ISIL and now fear it. The answer to the Islamic State from the Saudi Royals and the United States has been to arm even more Sunni rebels to fight both the ISIL and the Syrian government. Of course this is not working at all, and more and more of the “rebels’ we train join the Islamic State or al-Nusra. As the Islamic State spread into northern Iraq, tens of thousands of secular leaning Iraqis, Christians and Shiites fled. Iran, which is Shiite, is assisting Shiite refugees and organizing Shiite militias to fight the ISIL, much to the dismay of the Saudi royals and the United States. 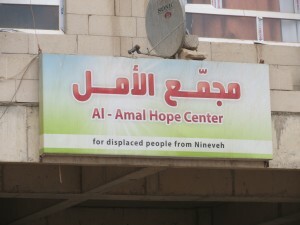 But there is very little help for the Christians who fled. That is why I headed to the Kurdish area of Iraq on September 4th of this year. Because of the huge time difference, I arrived in Amman, Jordan late in the afternoon of September 5th and rested up until 1:00 in the morning of September 6th. I then met up with our associates from Jordan to fly to Erbil, which is located in the Kurdish region of Iraq. The schedule has been hectic and because this newsletter must go to the printer five days in advance of the publication date, that is about as much detail of the mission as I can give for now. The next newsletter will have complete details of the mission along with some photos. Why is Europe being overrun by “immigrants”? Seventy-one Syrians were found suffocated to death in a truck near Vienna, Austria on August 27th. The refrigerated poultry truck was found on the A4 highway not far from the airport where I changed planes when flying form Washington’s Dulles International Airport to Amman, Jordan. I have been unable to determine if the dead Syrians were Christians or Muslims, but the victims were both male and female and one was a baby girl. Normally the fleeing Muslims are all men who leave women and children behind. The Syrian Orthodox Church in Vienna has helped many Christians enter Austria from Syria and the congregation ofover 700 is now mostly refugees. Austria is a nation of just eight million people. That is just a little less than the population of New York City, yet this little nation has the highest per capita immigration of any European nation. This is quite a burden on such a small nation. The Obama Administration has jailed Syrian Christians who managed to escape to the United States, but the Austrian government welcomes Christians. Last year there was an airlift of 500 Syrian Christians from Turkey to Austria. Those dead in the truck may very well have been Christians trying to get to Vienna to seek asylum, which would have been granted. Riots in Hungary, death off the Italian coast: Every day there are stories of “immigrants” from North Africa and the Middle East drowning when their small, overcrowded boats sink. Recently a photo was shown around the world of a young boy’s lifeless body being picked up where it had washed ashore on a beach in Turkey. There have been riots at the main train station in Budapest, Hungary as refugees from Syria and Iraq demand to board trains for more wealthy European nations. There is talk even from Germany’s Chancellor Merkel that borders may have to be reestablished inside of Europe to maintain order. Global warming is not the reason hundreds of thousands are fleeing Libya, Yemen, Iraq and Syria. Sadly, the reason for the greatest immigrant crisis since World War II is Hillary Clinton, and the emails she tried to hide are beginning to give the details. In March of this year I wrote an article entitled “Hillary Clinton’s Grand Strategy for the Middle East” which was published in numerous places including WND.COM and Western Journalism. In that lengthy article I gave the details and sources of Hillary Clinton’s plan as Secretary of State to install the “moderate” Muslim Brotherhood into power throughout the Middle East. The idiocy of the plot undoubtedly came from her longtime aide and confidante Huma Abedin, a Muslim whose family was deeply involved in organizing the Muslim Brotherhood and Muslim Sisterhood in the United States. 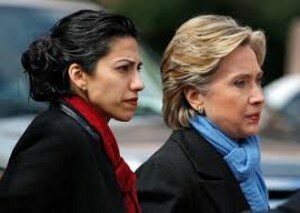 Huma & Hillary. Huma Abedin is closely linked to Muslim Brotherhood operatives. Department business had more to do with Huma Abedin than with the promotion of the Clinton Foundation. Hillary Clinton wants to be the President of the United States and planned to run while Secretary of State. She destroyed the state of Libya to show how tough she would be as a world leader. Her plan was to install the Muslim Brotherhood. Instead, she birthed a failed state that became the base of several well-armed Islamic terrorist organizations. One of those, a branch of the Islamic State, beheaded twenty-one Egyptian Christian workers on a beach in Libya in February of this year. Emails linking the Benghazi deaths of American embassy personnel in 2011 and the transfer of Libyan arms to “moderate” Syrian rebels, were also probably among the “personal” emails she had wiped off the server. But the evidence to her total incompetence on foreign affairs is available elsewhere. The name of the ship is known that was used to carry weapons from Libya’s old arsenal to Turkey bound for “moderate” Syrian rebels. Some of those heavy weapons may have been used to route the Iraqi Army out of Mosul. This is the baseline fact: When Hillary Clinton was sworn in as Secretary of State, the Middle East was more or less stable and fighting had been greatly reduced in Iraq. By the time Hillary Clinton left that office, five national governments had been toppled and three of those, including Libya, became failed states. Her support of the Saudi plan to topple President Assad in Syria led to birth of the ISIL and the loss of the entire north of Iraq. As a result, Iran has been able to spread its influence into Iraq to protect Shiite interests. Is it any wonder the Hillary server hard drive was wiped clean? If Hillary Clinton prays, which I doubt, she is probably on her knees every night asking God to wipe the hard drives of the State Department servers as well. Another Hillary Clinton aide, the man who set up her private server to conduct government business for the State Department of the United States, has stated that he will plead the Fifth if called to testify about the server. Bryan Pagliano, an aide to Hillary Clinton’s 2008 presidential campaign who helped set up the server system, was asked to testify about the server by the House Select Committee on Benghazi this month. His legal counsel has now told the committee that he would plead the Fifth Amendment, refusing to answer any and all questions, if he were compelled to testify. The Washington Post reported that Pagliano had worked as the IT director on Clinton’s 2008 campaign, and was then tasked by Clinton to oversee the installation of her server to handle her correspondence while Secretary of State. This was done before he was employed by the State Department in 2009. While doing the setup of the server system for Clinton’s State Department correspondence, he was apparently being paid by a political action committee tied to her. Who got him the IT job at the State Department? I think we can figure that out. The transfer of weapons from Muammar Gaddafe’s captured arsenal in Libya to some Syrian “moderate” rebels (who turned out to be Islamist killers) was clearly illegal and could not be discussed using the State Department e-mail system because of the possibility of a Freedom of Information Act lawsuit discovery. The fly-by-night system was clearly constructed to circumvent the law and shield Hillary Clinton from discovery of illegal acts. Of course the emails probably exist … Perhaps the best way to obtain these would be for the FBI to request copies from the Chinese or Russian intelligence agencies. The hidden 9-11 facts about Saudi Arabia: This newsletter is being mailed on the 14th anniversary of the 9-11 jihad attack against the United States that destroyed the World Trade Center. Congress returns from recess on Monday, January 14th. I would issue a challenge to you, to help get out into the open the hidden truth about Saudi Arabia’s involvement in the 9-11 attack on America. In the past three newsletters I discussed the 28 pages of the official 9/11 Report that have been kept secret because they clearly indicate that there was involvement by the Saudi royals in the jihad attack on the Trade Center and the Pentagon. I was working with Senator Rand Paul’s office and other Senate offices during all that time, in an attempt to pass legislation that would force the release of the redacted 28 pages. Only three Senators, led by Rand Paul, have been brave enough to introduce the required legislation to make those 28 redacted pages of the 9/11 report public. Making the documents public would make it possible for the families of the victims of the 9/11 jihad attack to sue the Saudi supporters of al-Qaeda. The Saudi royals have enormous influence on American business interests and in the Congress. They even own part of Fox News. The media has been virtually silent about this legislation that would expose the Saudi royals. This bill cannot pass without massive pressure from voters such as yourself. Please call both of your Senators and ask that they co-sponsor and support S.1471- the Transparency for the Families of 9/11 Victims and Survivors Act of 2015. You can call both your Senators through the Senate switchboard on Capitol Hill at (202) 224-3121. Post Card Program notes: the entire last issue of the newsletter was dedicated to responses from congressmen and Senators to post cards you had mailed to Congress. Some responses were far out of date — one Senator mentioned nothing new past 2011. Some were close to the bizarre and ignorant, as if staff members had no concept of the subject at hand. In the Senate the most off-subject responses came from Senator Elizabeth Warren, who is widely seen by liberals in the Democratic Party as presidential material and preferred over Hillary Clinton. “I support our foreign aid through the International Disaster Assistance (IDA) and Migration and Refugee Assistance (MRA) accounts to address urgent humanitarian needs in Syria and around the world.” Her letter sums up exactly how responsive our Congress can be to the concerns of constituents.